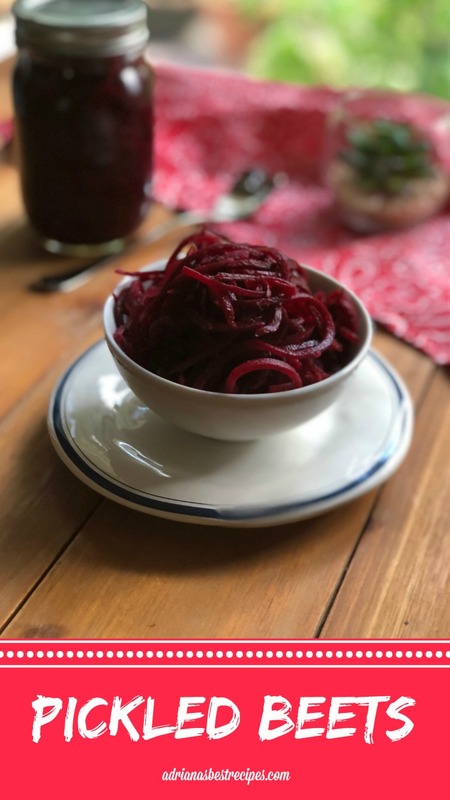 Spiralized Pickled Beets to use as a Garnish and Much More! Pickling is such an ancient food preservation technique using vinegar and spices so we decided to make spirals of pickled beets to use as a garnish in salads, tacos, and much more. Beets are a very common root in many cuisines. In fact, Mediterranean, Polish, and Mexican cuisines use them in many different applications. Either raw, in juices, soups, salads and as garnishes. Pickled beets are easy to make and for those that do not enjoy them when trying them, pickled everyone falls in love with the taste. Because the beets have sweet and sour notes and being cut in spirals are so much fun to eat. In Northern Mexican cuisine, we like to use beets and carrots to garnish tacos dorados and tostadas but you can use this garnish in burgers, grilled meats, or enjoy as a snack. The pickled beets can be prepared in so many different ways. But this time we made them just with vinegar, pink salt and a dash of cumin. 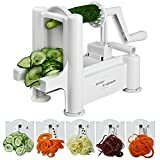 You can purchase a spiralizer to cut the beets but I found them already cut and ready to use at the supermarket. 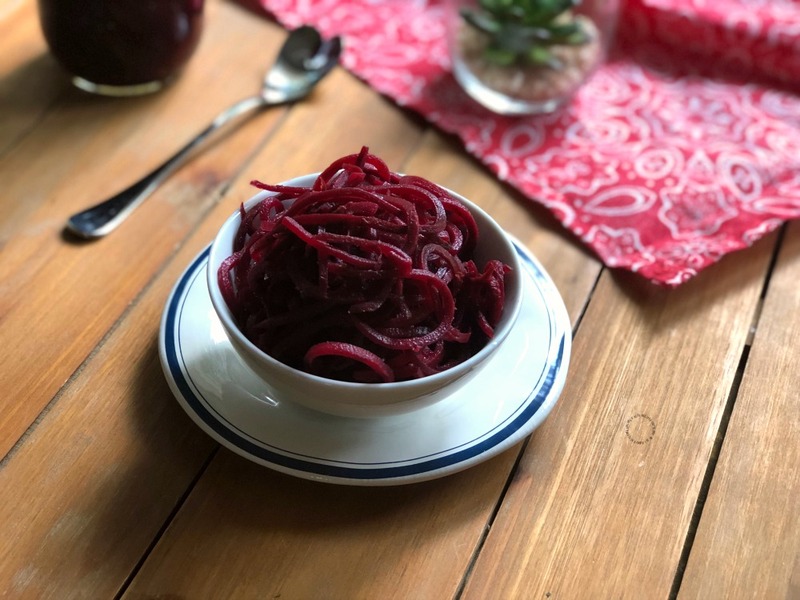 You can opt for buying frozen spiralized beets too. Watch the video for detailed instructions on how to make this yummy recipe! Sometimes people think pickling is cumbersome and difficult but it is not. Requires very few steps and ingredients. You can enjoy the pickled veggies following day, as this recipe requires overnight pickling inside the fridge for better results. 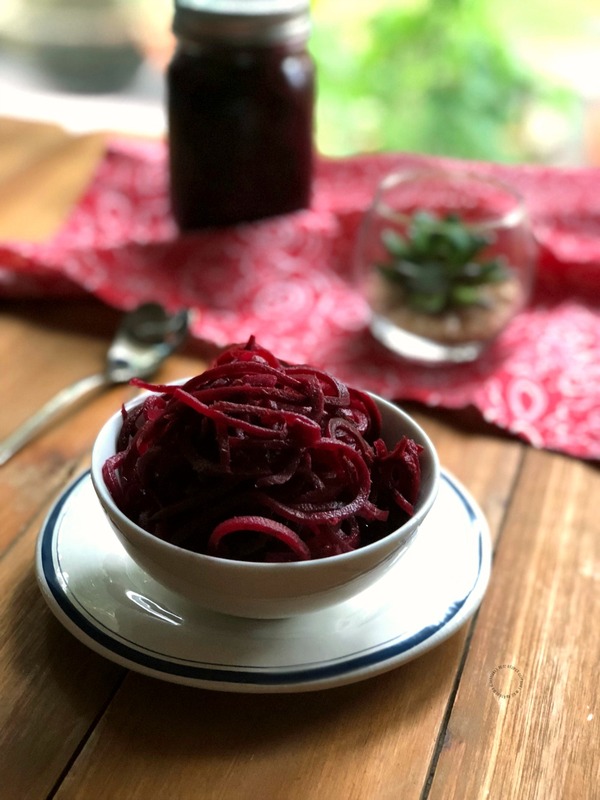 Pickling beets or any other hard veggie is a good way to preserve the harvest and to enjoy veggies in a different way to add pizzaz to our daily meals. The pickling technique can be used to preserve other veggies such as new petite potatoes, jicama, carrots, sweet peppers, onions, cucumbers, serrano and jalapeño peppers, and cabbage. It is recommended to choose hard veggies for best results as those need to be crisp even after pickling is done to add texture to the dishes we are pairing with. Pickling is such an ancient food preservation technique using vinegar and spices so we decided to make spirals of pickled beets to use as a garnish. 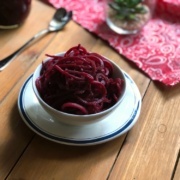 This is a simple recipe that has beets cut in spirals, vinegar, and spices. 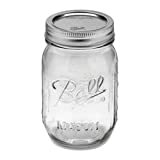 Then pickled inside the fridge overnight inside a mason jar. Use precut beets in spirals or cut your own. 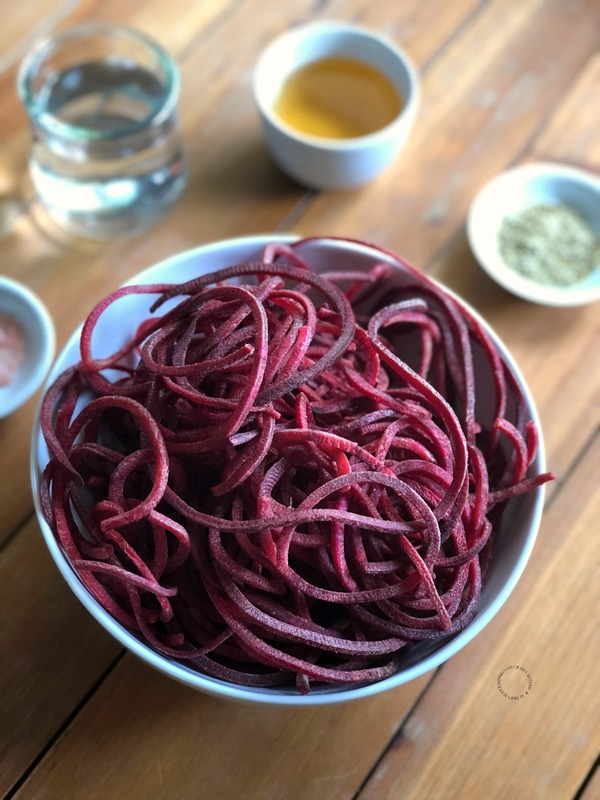 You can use frozen spiralized beets too. In a mixing bowl add the vinegar, the warm water, the pink salt and the spices. Mix well. Add the raw beet spirals and mix with the vinegar broth. Place inside a mason jar, seal and pickle inside the fridge overnight or minimum 3-6 hours. Use the pickled beets to garnish tacos, salads, in sandwiches, with grilled meats and fish, and much more. This recipe requires pickling inside the fridge overnight. Ohhh I never tried pickling beets before! Looks super tasty! This looks so easy, I’d love to give it a try! I’ve been thinking of trying my hands on pickled beets for a while now, thanks for the recipe. Great pickling tips! Love the spiral idea too. Can’t wait to use this recipe when pickling our veggies. I just had beets noodle the other day and instantly fell in love with it. This pickled beets sounds so awesome and can’t wait to add this to my grilled burger this weekend. My mom always made pickled beets. This brings back so many memories for me. 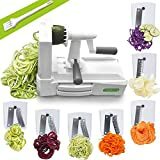 I love using my spiralizer. Hers were just sliced. This is my way of doing pickles for sure. Quick and easy. I may actually have to try this out, I don’t like beets (bad I know!!) but like you said, pickled everyone seems to fall in love with them <3 I love to try new recipes especially with foods I wouldn't normally eat! I love beets but have never pickled them. You make it look so easy! I def want to try doing this! These look so easy and delicious! I like beets but I’ve never tried them pickled – I bet it’s great!